CANTON, Mass. 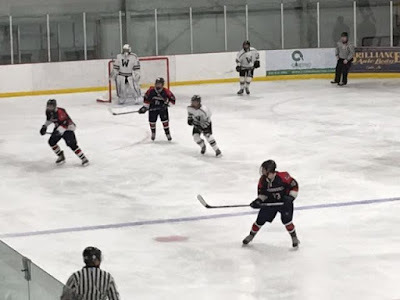 - Ben Lewis' goal 7:50 into the third period pushed Westwood back in front, and the Wolverines held on for a 4-2 victory at home against the Pembroke Titans Wednesday afternoon. "We're fortunate to get a couple of breaks here and a couple of goals," Westwood head coach Mike Welby said. "The hope was really to kind of pick it up a little bit, but despite that and the overall effort, which I thought a little lackluster today, we're still fortunate enough to come out of here with two points." Pembroke (1-4) outshot Westwood heavily in the first period as the Titans dominated possession of the puck, but were unable to slip one past Wolverines goalie Justin Anderson. "I thought for a good part of tonight we were chasing the puck," Welby said. 8:22 into the first, Westwood captain Sam Murphy took a centering pass from Connor Donahue and beat Titans netminder Justin Pijanowski as the Wolverines drew first blood. "Murphy [has been] great," Welby said. "He's our leader. He's the one we point to lead by example and he's certainly done that. What Sam lacks in skill, he certainly makes up in effort." Less than two minutes later, Donahue found himself feeding Thomas Keith and the senior lit the lamp to make it 2-0. "I think after we came out in that first period and popped two goals, I didn't think that was really our best period of hockey and I think Pembroke would say the same," Welby said. However, Pembroke would respond in the second. The Titans continued to fire shot after shot on the Westwood net and outshot the Wolverines 7-1 seven minutes into the frame. With 7:30 remaining in the second, right winger Brad Harland finally got Pembroke on the board, beating Anderson to his glove side to side to slice Titans deficit in half, 2-1. Less than three minutes later, Zach Simpson knotted the score at 2-2 off a cross-net pass from Harland. "They were doing a great job moving that puck wing to wing and board to board," Welby said. "I think we needed to adjust in that regard. They were getting a lot of offensive opportunities and by the time we got back in our zone, we weren't chasing people down or being physical and that caused a lot of problems." Tied early in the third, Westwood found itself on a 5-3 power play after a pair of cross checking calls on the Titans but were unable to make anything out of the advantage, as Pijanowski held his own in net. Lewis would then take over for Welby's club. With 7:50 remaining in regulation, the senior poked one home and the Wolverines reclaimed the lead 3-2. "Benny [has been] phenomenal," Welby said. "He's been a kid that's been coming up and working hard for years and now his senior year, he's been making the most of his opportunities when he has the puck on his stick." Trailing by one with under two minutes to go, the Titans opted for an empty net, and Lewis secured a Westood victory with his second goal. Wolverines starting defensemen Ben Shields and Jake Shields put forth solid efforts all contest. Pembroke looks to get back on track Saturday when it hosts North Quincy at 3:10 p.m.
Westwood looks to keep it rolling at home against Oliver Ames Friday at 1:50 p.m.
"We got to learn from our mistakes," Welby said. "We just haven't played well enough, in my opinion, to go out against the Medways and the Scituates if we want to compete with them."